Organizations gather at the 2016 Valor tailgate and resource fair last month. Veterans' day of service is moved to next semester after staff turnover. A day of service designed for student veterans initially planned for the fall will be held off until the spring, after two people charged with running the event left the University. 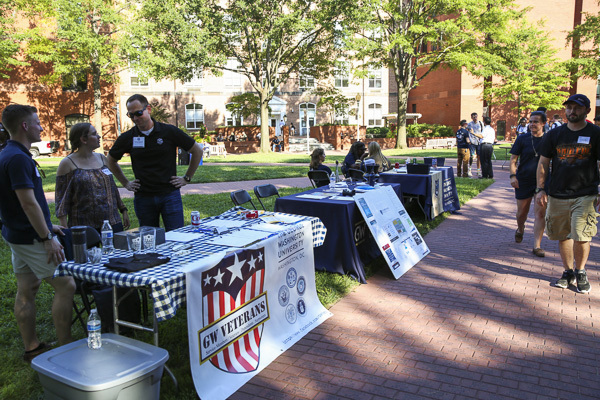 The event, which connects GW student veterans with service projects for the day, was supposed to happen next month. The majority of the event’s coordination falls in the hands of a temporary employee, and student veteran leaders said that turnover in this position, among other staff changes, caused a delay in planning. The service day is a trademark event of the Veteran Service Initiative, a student veteran effort operated through the Nashman Center for Civic Engagement and Public Service. Last year’s day of service, held in October, was only the third since the initiative started in 2011. Matthew Basista, GW Veterans’ civic engagement coordinator, said staff changes in the Nashman Center over the summer have slowed down the planning and left the event without a director. Before the summer, there were five staff members in the Nashman Center dedicated to the Veteran Service Initiative, Basista said. Now there are three — Basista, Nashman Center executive director Amy Cohen and the newly hired AmeriCorps Volunteers In Service To America, German Sanchez. The leadership of the Veteran Service Initiative is temporary by nature: The Nashman Center employs multiple AmeriCorps VISTA fellows each year, who commit to a year of service at an organization in exchange for a monetary educational award to attend graduate school or pay off student loans. A VISTA fellow takes on the responsibility of running the Veteran Service Initiative, including the day of service. Basista said natural turnover can present a challenge in “continuity,” because the VISTAs only serve one-year terms. Cohen said in an email that the AmeriCorps fellow for this academic year will organize service for and with military and veteran students and families. “We have and will continue to work with other veteran service offices and organizations across campus to create opportunities for veteran and military family service,” Cohen said. Last year’s VISTA, Blake Lovelace, along with Charles Basden and Maurice Smith, two Nashman Center employees, made up a team that ran the third-ever day of service last fall, Basista said. Basden and Smith both left the University over the summer. Basista said that Basden and Smith’s two now-vacant positions were “morphed” over the summer. The University is currently searching for two senior program associates to focus on service and social innovation, and academic service-learning, according to GW’s jobs website. Basista said that the University has assured him that the new hires will be made by January, allowing the group the time to plan the event for sometime in March. Yannick Baptiste, the president of GW Veterans, said the student group supports the decision to postpone the event because the originally planned date presented scheduling conflicts for many student veterans whose reserve units have obligations during the fall. Baptiste said holding the event in the spring does present an added visibility challenge because Veterans Day in November often attracts attention to fall events. Still, holding the event in the spring means that the group will not have to compete with other veteran service organizations who put on Veterans Day events. Vaidehi Patel and Sam Rosin contributed reporting.